Colostomy closure or colorectal anastomosis is a procedure that is done to close the opening created for a colostomy bag. when a patient is done wearing a colostomy bag after days, weeks or even months doctors remove the attachment and close the opening. 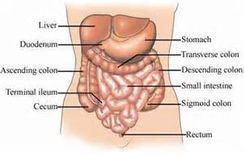 This enables the patients to return to normal bowel function. Gastric resection is the surgical removal of part or all of the stomach, usually performed in the treatement of stomach cancer or intractable peptic ulcer. Lysis of adhesions is cutting scar tissue inside the body to detach two intersecting membranes or to prevent this action from taking place following surgery. Scar tissue left behind can create numerous complications when two segments connect. A splenectomy is a surgery to remove the entire spleen, a delicate, fist-size organ that sits under the left rib cage near the stomach. The spleen is an improtant part of the body's defense immune system. It contains special white blood cells that destroy bacteria and help your body fight infections when you are sick it also makes red blood cells and helps remove, or filter, old ones from the body's circulation. Intestinal Surgery is surgery to relieve a bowel obstruction. A bowel obstruction is when the contents of the intestines cannot pass through and exit the body. A complete obstruction is a surgical emergency. The whipple procedure is the most common operation to remove pancreatic cancers. The whipple procedure may also be used to treat some benign pancreatic lesions and cysts and cancers in the bile duct and beginning part of the small intestine.